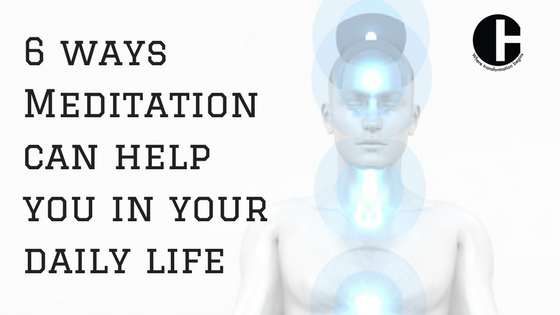 In this post, I talk about 6 ways meditation can help you in your everyday life. You might be thinking, Are there only 6 ways ? My answer is no, but these are useful in day-to-day life. Meditation means different things to different people. It is a process of uniting the Body, Mind and Soul. Meditation is the process of watching yourself, read MIND and focusing awareness. Once you know and understand your MIND, then it becomes a direct path to know your Self. It gives you clarity and wisdom and has practical applications in daily life. Meditation is a pathway to freeing yourself from the compulsions and dramas of your Mind. Meditation is a process which allows you escape the clutches of your overactive and habitual Mind. Meditation is the ability not to press the ‘PANIC’ button when faced with challenging situations. It is easy to define what Meditation is not. Learning to Meditate is one of the smartest moves you will ever make. Why? Because Meditation is POWER and it will help you do better whatever that you do. Stress is primarily caused by jumbled thoughts that crowd your mind. Did you know that on an average you think about 50000 thoughts per day? This translates up to 35 thoughts a minute! Because of the speed at which you think, the brain is not always able to process each thought. In fact, you are not even consciously aware of thinking half of these thoughts. Stress is caused by these accumulated, unprocessed thoughts. Have you ever had the nagging feeling that you were supposed to do something important but can’t remember what? That is exactly what I am talking about. When you sit and close your eyes and focus your attention on your breathing and start meditating, these jumbled thoughts get slowly flushed out. This helps in slowing down the inner traffic of thoughts and lowers stress. Recent studies have also shown that meditation activates centers in the brain that govern thinking and control of worry. So the first basic benefit of meditation is that it reduces stress. This also carries with it numerous health benefits. When you are stressed out, your body manufactures a hormone called cortisol, which helps in dealing with that stress. However, continuous stress leads to highly elevated levels of cortisol which can lead to problems like poor immunity, increased blood sugar and sleep problems. When we meditate, your brain relaxes, thoughts and stress levels are reduced, and as a result your cortisol hormone production reduces. This will boost your immune system, regularize blood pressure, blood sugar and make sure you have a restful sleep! Here is a Infographic which gives 17 reasons to avoid stress and the effects of stress on the body. Let us say you have an important meeting coming up, and you are tense about the outcome of the meeting. You need to be calm and relaxed at that time so that you can focus on delivering what you want to deliver or saying what you want to say. If the meeting is about to happen in the next half hour and you are pressed for time, the easiest thing to do is immediately shift your focus from what you are about to do in the next 10-15 minutes to THIS moment where you are taking the in-breathe and out-breathe. Inhale and exhale, inhale and exhale for at least 12 cycles (1 inhalation + 1 exhalation is 1 cycle). Automatically your head becomes much clearer, you are calmer and it is easy to say or deliver what you want to say and deliver. Every day you are faced with many decisions, and choose many things and your choices determine your life. Today whatever you are, whoever you are is because of the choices you have made. So it becomes very important that you make the right choices. How do you do that? When you are faced with a choice; for example, you have to choose between A and B, instead of going with the decision that seems logically obvious, use your intuition to tell you which path to take. How can you access your intuition in that moment when you have to make the choice? The easiest way is to ask yourself the question, ‘What is right for me’? And then wait for the answer. And when you are waiting for the answer observe your breath. Take a deep breath and exhale. Inhale and exhale, inhale and exhale, for at least 30 – 60 seconds. The answer would have already popped up. That’s the right answer. And more often than not, the answer will not be the answer you are expecting! Try it. Your brain has a frequency of about 15 cycles per second (cps) and above in a normal wakeful state. When you start meditating, this drops down to about 10 cps; which is the alpha state (7 cps – 10 cps). When you are in the alpha state, it is much easier for the brain to relax and focus on one task at a time. Any form of meditation, it doesn’t matter which one, if you practice it continuously for 3-6 weeks, from the 7th week onwards your focus will be like that of a laser! But if you want to improve your concentration like that of a Zen Monk . Then you can try my 21 day concentration course, which helps you develop incredible concentration in just 21 days. When you learn to focus, you increase your awareness which helps you have more POWER in your life. When you have power, you concentrate better, when you concentrate better, you perform better. When you perform better, you accomplish more. It doesn’t matter what you do, you will do it better. When you are about to enter a difficult situation, like getting into an operation theatre, or you are taking a major financial decision or thinking of a career change, or investing in a business/stock; always before taking that step, close your eyes, imagine the step you are going to take and bless the situation by saying thank you, thank you, thank you about 50-60 times. This is the easiest way to create positive energy around the outcome. It doesn’t matter what state you are in at present, because ANYTHING can happen in THIS moment. So if you can change the vibration and frequency of that situation by blessing it and showing gratitude, the entire situation changes and you will be surprised with the results! Meditation improves beauty. Your skin will glow. How? When you are stressed and worried about something, there is increased blood flow to the brain, away from your skin and other parts of your body. So what happens is, the skin does not get the required nourishment. When you meditate, your brain relaxes, your blood vessels relax, and the blood that your brain was using up to keep up the stressful thoughts is now released to flow to the other parts of the body. So there’s an increased flow of blood to the skin bringing with it the much needed nourishment. Your eyes will become brighter, hair loss will be a thing of the past and the internal organs will improve in their function which will obviously lead to many more good things. A good place to start will be to download these three meditations . So these are 6 basic ways in which meditation can come to your rescue. Are these enough to get you started?! I hope you practice them and get the benefit. Let me know if meditation has helped you in any way by commenting below. It will help others to start the practise. Can meditation build your brain power?